Well in my efforts to draw something just for fun every day I sometimes fall a little short or just make no sense at all. 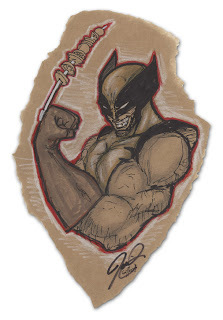 With that said I have no idea why this little sketch that I did to commemorate my 100th hit (or pageview) on DeviantArt is of Logan with a "Wolver-kebab". Anyway, if you have some time shoot on over to D.A. and check out my gallery. There are a few repeats but a lot of it is different than what is here. By the way it's just a quick little sketch but I'm bothered by his arm other than that it's decent I guess. Hmmm, maybe two elbows in one arm is an interesting mutation that no one has used before.